Exclusive collection of professional sound programs contains vintage synth emulations, synth pads, synth basses, synth leads and synth programs specially designed for using with Kurzweil PC3 internal arpeggiator. The PC3:Works - Synth Collection is a special bundle including our PC3:Works - Synth Collection (Volume 1 - Volume 6). This soundware collection is carefully categorized to provide efficient searching and better user comfort for studio composing and live performance. This soundware category has been designed with a special emphasis on the so called “old school” feeling. It contains emulations of famous vintage synthesizers (e.g. Moog, Oberheim, ARP, Sequential Circuits, PPG, etc.). A large collection of warm, lush, sharp and modern “analog & digital” synth pads carefully designed for various music styles. Selection of monophonic and polyphonic leads with 70s and 80s retro feeling, including contemporary experimental leads. The aftertouch and portamento is extensively used to emulate the real lead synthesizer play style. Analog and digital synthesizer bass programs, including exclusive MiniMoog emulations based on KVA – Virtual analog oscillators and excellent Kurzweil´s Mogue LP filter. Sound programs designed for the Arpeggiators and Step sequencers. The ARP/SEQ programs use filtered KVA – Virtual Analogue Oscillators - Saw, Square, Super Saw, Triple Saw and PWM, with extensive support of onboard real time MIDI controllers. For detailed description of the Kurzweil PC3K/PC3 and PC3LE MIDI controller settings, see the “PC3K/PC3:Works real time MIDI controller standard” table below. Category containing leads and filtered programs with the oscillator sync. Oscillator sync is one of the features available on synthesizers with two or more oscillators, where one oscillator restarts the period of the second one, so they have the same base frequency. The timbre is then altered on the synced oscillator by adjusting its frequency input providing sharp and metallic sounds. Note: This soundware collection is designed for Kurzweil PC3X, PC3 and PC361 synthesizers without optional ROM boards installed. 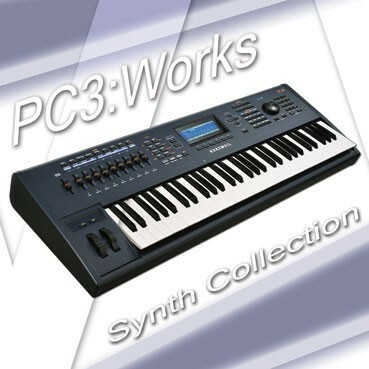 PC3:Works – Synth Collection is designed for Kurzweil PC3X, PC3 and PC361 synthesizers. It is also possible to use the PC3:Works – Synth Collection for Kurzweil PC3LE8, PC3LE7 and PC3LE6 synthesizers but with the limitations of certain sound program parameters controlled via onboard MIDI controllers. Most of the PC3:Works sound programs support the Kurzweil PC3 keyboard velocity, press sensitivity and also onboard MIDI controllers. The controller sliders and wheels are used especially for synth basses, ARP/SEQ and Sync programs. Sound program Layer detune, PWM, Shaper amount, Sync oscillator pitch, etc. *) Kurzweil PC3LE synthesizers have a different set of the MIDI controllers onboard than Kurzweil PC3K/PC3, however any programmable external MIDI controller can be used to transmit the required standard MIDI CCs described in first column of the above sheet. Detailed information is available in our PC3K/PC3:Works - Synth Collection - Reference Guide (PDF document).